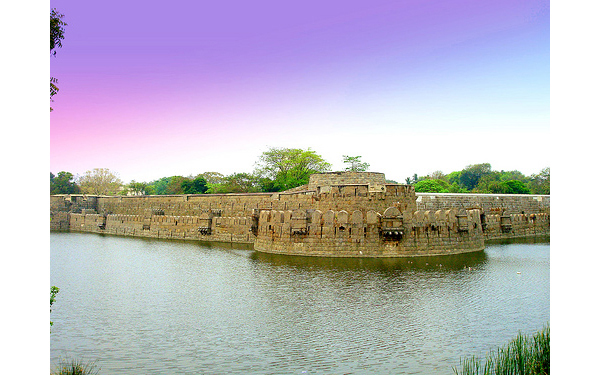 VELLORE FORT :The fortification of the fort consists of main rampart broken at irregular intervals by round towers and rectangular projections. The walls are constructed with hewn Kangaroo stones of rectangular shape. The walls of the fortress are connected so that the outer wall which is lower than the other, which is extended to the inner wall, from a curtain of enormous thickness which cannot be affected by gun, spears and arrows. The upper parapets are built lined with brick work in which embrasures are cut. This is evidently the work of European engineers at a later period of fort's history.